Now that we're in the colder months, for most of us our skin tones are becoming paler. 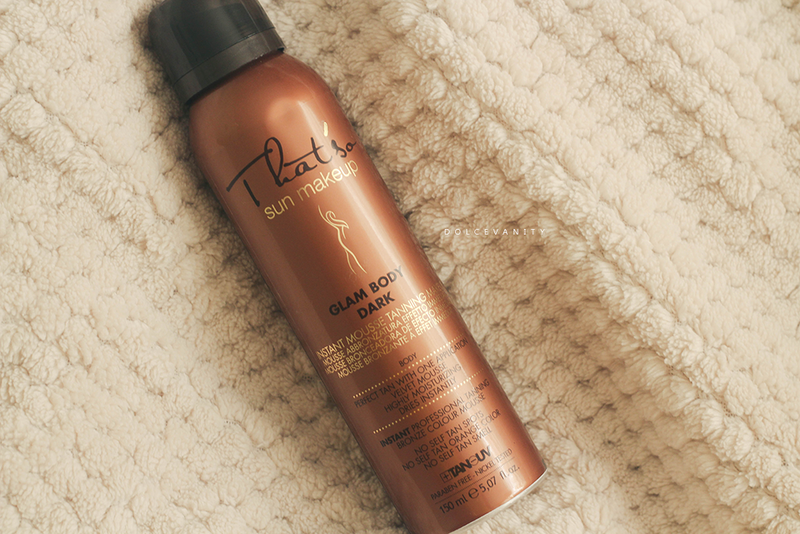 Some of us ride with it, others grab for the faux tanning. That'so is a new company introduced to me and I was sent their Glam Body. This is an intensive tanning mousse. The instant tan develops within 3-4 hours and with claims of that non biscuit smell and zero skin patching/streaks it sounds like a tanner's dream. It's an 100% natural and paraben free tanning formula that'll give you a tan for 3-4 days and fade out naturally. Lecithin - a natural emollient that attracts water and acts as a moisturizer. Leaf Extract - Acts as a moisturizer and helps protects the skin from UV damage and from free radical compounds which damage the cells and cause premature aging. It rejuvenates aged tissues and promotes healthy skin and is an excellent cleansing and detoxifying agent that has ability to remove dead skin cells and toxins while purifying the pores. Ethylhexylglycerin - Used as a skin conditioner. Palitoyl Pentapeptide - A skin conditioner known to have the ability to promote collagen, elastin, and glycosaminoglycan synthesis. This would result in an ability to restore skin thickness, which diminishes with age, and to reduce the appearance of lines and wrinkles. Arginine - An ingredient that has the ability to increase the skin’s oxygen consumption and to improve skin moisturization. Pisum Sativum extract (pisum sativum (pea) extract): Contains vital amino acids and proteins necessary for the production of collagen and elastin. Also reinforces the skin’s natural defense in fighting free radicals. 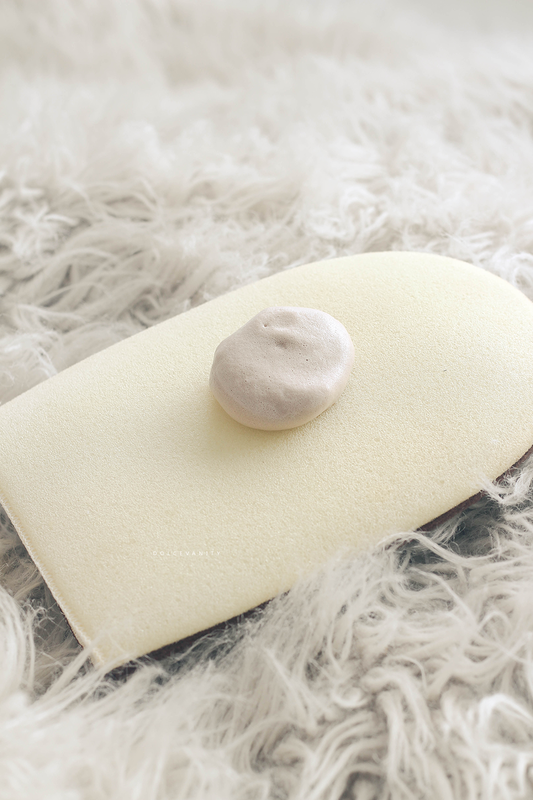 You can use, gloves, a mitt or your hands to apply this mousse. I decided to use a clean mitt. My legs had been freshly epilated and exfoliated the night before, making sure I had a smooth, clean and even base to apply the product onto. Shaking the bottle for a few seconds I squirted a generous amount of mousse onto the mitt. It comes out white but you can start to see the mousse change colour as it gets into contact with the air. I worked from the bottom of my feet upwards. Taking care of areas such as around my ankles and the back of my feet. There wasn't the distinctive smell of burnt biscuit that you'll normally get with self tanner but the sweet smell of the application could of been the almond scent that it has. Application wasn't messy or sticky and pretty easy! Above my legs before the tanning. I used the same ISO level to capture both images. I took the last image after 3 hours because the sun was going to bed and I wanted to show the development. By the next day they were a lot browner, more a golden brown, there wasn't an orange tinge, no patches or streaking, I was very impressed. My only application mistake was I went a little too heavy around the back of my foot - nothing a little soap and water with my salux couldn't fix. I didn't find the colour to be overbearing for me, I think I'd love to do it as an all over tan at one point. Although my hands had a slight 'tan' smell to them even after washing them after application with warm water and soap and of course 2 showers later. It faded by the 2nd night. The tan is still going strong and I use my salux cloth to wash my skin daily so it gets an exfoliation regardless. The tan is still going strong and as it's fading there's no patching or flaking. Do you tan in the winter? An intense tan is just what I need right now :) will have to check this out! Wow it really made a nice difference. I've only ever self tanned twice once because at work we got self tanner as gratis and then I also have the Tarte Self Tanner which I like but I'm too lazy to up keep my tan lol so I don't use it to offen. I ve never tried this product before, but it looks nice!